So you have a presentation, a pitch, a speech, or a client meeting. How do you maximize your credibility and persuasiveness? Here are a few tips to follow while creating your presentation and delivering it. 1. Research your topic and know it well. You are the expert in the room when you are speaking, so own it! Anticipate those difficult-to-answer questions that may come up during Q&A, and build them into your presentation to avoid being caught off-guard or looking like you are unprepared. 2. Organize your thoughts. Having an organized presentation will help your audience retain information and follow along. No one likes listening to presenters who seem to ramble on with seemingly no meaningful purpose or point. 3. Practice your presentation. The more times you run through a presentation, the more comfortable you will be. Also, you will be comfortable enough with the material to proceed even if the technology fails on you or, say, there is a power outage and you still have to present. 4. Do not memorize your presentation or speech unless it is mandatory. There is nothing wrong with looking at your notes or having notecards with you. If you try to memorize your presentation, there is the risk of not remembering all of it or nerves causing you to lose your place. 5. Visual aids are useful when used appropriately. No one likes suffering through a bad PowerPoint full of tiny text. Strategically build in interesting and relevant photos to keep your audience’s attention. Remember to use this tool as a supplement, not a crutch. Thus, I recommend drafting your presentation first and then building your PowerPoint afterward. 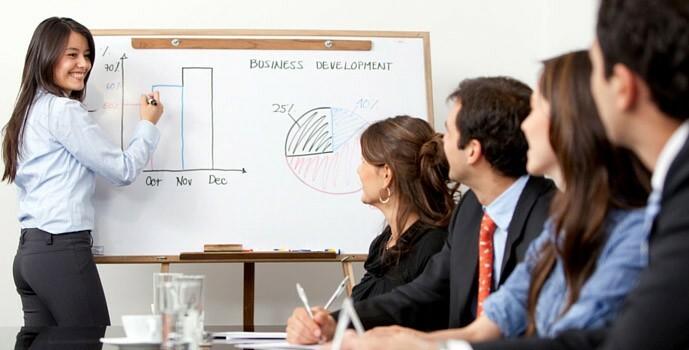 Many people make the mistake of assuming a PowerPoint or Prezi is required for every presentation. It is not. Visual aids supplement your presentation, so keep the focus on you by being well organized and prepared. 1. Maintain eye contact with your audience. Eye contact is a simple way to connect to your audience, but do not single out and stare one person down. Try to scan the audience and connect with as many individuals as possible. 2. If you use a PowerPoint, do not read off it. It’s probably safe to assume your audience is smart enough to read the slides on their own. Use the PowerPoint to your advantage by supplementing your words with photos or videos. 3. Look sharp. Like it or not, your appearance is a huge factor in being a credible presenter. You will want to dress appropriately for the occasion, but choose something that makes you feel confident and attractive. 4. Work the room. If there is a podium or large desk, don’t hide behind it. Use meaningful gestures and movement to capture the audience’s attention. If possible, scope out the setting beforehand. This may not always be possible, but it will help you visualize your successful presentation. Remember, public speaking is consistently rated as a top fear in America, so you are not alone in being nervous. Some people fear speaking in front of small audiences, and others fear large groups. Following these few tips and practicing should help you go a long way! Kristen Foltz is a professor of speech at the University of Tampa. She also provides corporate coaching on effective presentation techniques. She can be reached at kafoltz@ut.edu.